Infinite 25 AP potions of healing and poison for healing up out of combat, and faster enemy and player movement speed. Heal up with Draughts of Endless Healing or Poison (for Zombie characters) with an infinite, 25 AP potion outside of combat. Face enemies with faster movement animations (but unchanged stats) so you spend less time waiting for them to run during their turn. While this doesn't affect their combat animations, and not every enemy is affected (though I think most are), a majority of fights should still feel a bit faster. Mod also includes faster run speed for players. If starting a new game, you'll start with 4 draughts of healing. If in a current game, purchase draughts of health/potion at potion vendors (e.g., Cylia the Enchantress in Cyseal market), or craft them with and arrow shaft + any healing potion or arrow shaft + any poison potion. 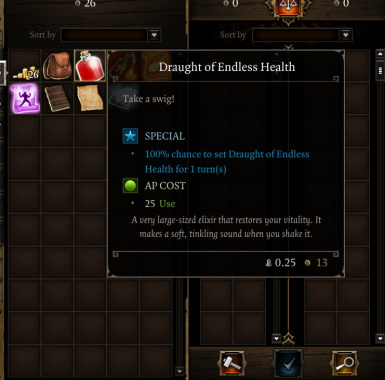 Note that you might need to wait for vendors to refresh their inventory (hour of real time passing or on level up) to see the draughts in vendors. Let me know if faster enemy speed messes anything up, like scripted events, or changes the balance of something somehow. I'm pretty sure enemies only walk outside of combat 90% of the time, so they should only zoom around in combat. Also let me know if the potions are exploitable or ruin something. I do expect they slightly ruin the threat of non instant-death traps since you can just constantly chug them, but just don't use them there if you feel like it ruins that situation. Installation: Place the "Public" folder in the extracted rar file into the data folder in your game directory. Rename the "MainLSF.pak" to "MainLSF.pak.original" (or anything, just to disable it. You can delete it, but it's best to leave it there in case you want to uninstall the mod.) This might seem strange, but it's necessary for adding new things and it doesn't take anything away. Basically just lets the pertinent mod files override the game files. If you don't want the enemy run speed changes, delete all the files in the RootTemplates folder EXCEPT the Consumables.lsb. (The lsx file doesn't do anything, and is just for convenient editing). This is also the process for uninstalling, basically, and throwing all your infinite healing potions away if you don't want them. You can't just delete the whole folder because basically you can't delete root templates for items midgame. Credit to Norbyte for extractor and Kidling for his original runspeed mod. See here if you want a slightly faster or slower player runspeed.